The Cook Inlet, located around in south Alaska, is a large estuary connected to the Gulf of Alaska. Dynamically, it is characterized with a huge tidal range and strong tidal currents. It is also one of the famous sites for tidal bores. Economically, it contains a large amount of oil and gas deposits. Leading by Dr. Mark Johnson at University of Alaska-Fairbank (UAF) and Dr. Andrey Proshuntinsky at Woods Hole Oceanographic Institution (WHOI), we have provided a technical support to apply FVCOM into Cook Inlet. A brief introduction of the Cook Inlet FVCOM is given here to summary the team’s accomplishments in development and validation of an unstructured grid finite-volume coastal ocean model (FVCOM); tidal simulation and process-oriented experiments with focus on tide- and wind-induced currents in homogenous and stratified conditions; and model-data comparisons for a hindcast simulation in September-November 2005. For the detailed information about the projects, please contact to Dr. Johnson at UAF and Dr. Proshuntinsky at WHOI. For technical questions regarding the Cook Inlet FVCOM, please contact Dr. Chen at the SMAST/UMASSD. 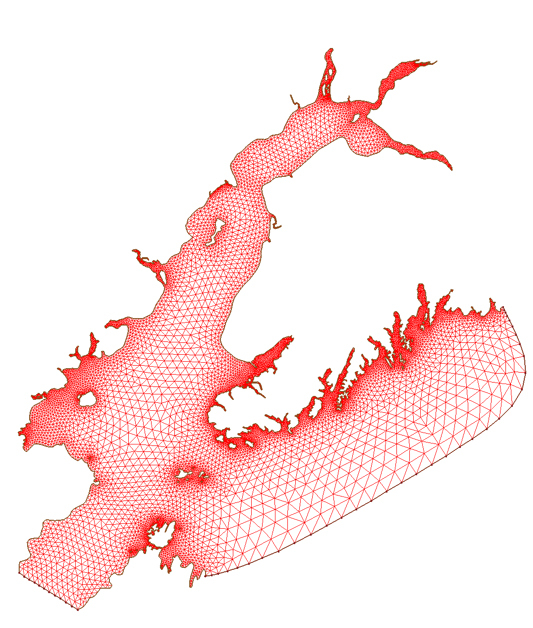 The Cook Inlet model was developed by configuring an unstructured grid Finite-Volume Coastal Ocean Model (FVCOM) for realistic geometry of the inlet (see the image on the right). The computational domain covers the entire inlet area with open boundaries over the continental shelf. Horizontal resolution varies from ~126 m near the coast and in rivers to ~13 km over the shelf close to the open boundary. 11 uniform sigma levels are specified in the vertical, which respond to a vertical resolution of < 2.5 m near the coast and about 30 m in the deepest region of ~300 m.
This model was driven by tidal forcing at open boundaries (three semi-diurnal: M2; S2 and N2 and two diurnal: O1 and K1), buoyancy input from river runoff, variable surface wind stress, and surface heat flux plus short-wave isolation. The tidal simulation is conducted by forcing the Cook Inlet FVCOM using the tidal elevation produced from the regional tidal model at ocean boundaries. Fiver tidal constituents are included: M2, S2, N2, O1 and K1. Due to a relative large uncertainty in the regional model, the tidal elevation at open boundaries was adjusted to provide the best agreement to the observational data available inside the Inlet. A particle tracking experiment was made to simulate the trajectories of drifters deployed during September 2005 under the realistic tidal conditions. The animation on the right provides a view of the movement of the model-simulated drafter#36190. The tidal model is spin up using our tidal forecast initial conditions of tidal currents and elevation and is driven by the tidal elevation provided by the Foremen’s tidal forecast program. A particle tracking experiment was made to simulate the trajectories of drifters in the realistic environment with inclusion of tidal and wind forcings as well as surface heat flux and river discharges. The initial conditions of water temperature and salinity were specified using the September climatological fields. The wind forcing was from the NAM model forecast ed field.